‘Czarina’ Kareena Kapoor tops the list of the most powerful personality of Bollywood. In a poll conducted by International magazine Verve, Kareena Kapoor bagged the highest number of votes for the most powerful celebrity. The actress finds a place of pride on the cover of the magazine’s latest edition. The power list accentuates the fact that Kareena is definitely going places. Besides films back home, Hollywood too has shown some keen interest in the actress. Sylvester Stallone has been mesmerized by the ethereal beauty on the sets of Sajid Nadiadwala’s forthcoming Kambaqt Ishq. Kareena Kapoor has captured the collective imagination and established herself as the biggest brand amongst her budding female actors. Her success and awards for her performance in Jab We Met has made her the hottest property amongst the big banners and the biggest of stars. Besides, the Czarina of Bollywood is also termed as the ‘Queen of Endorsement’. Top companies and product manufacturers want Kareena to be the brand ambassador and her name is taken in the same breath as top international models. Kareena eclipses the next generation of actress when it comes to the diversity in her choices, right from big budget fare with A- list directors to imaginative projects, she has literally done it all. She is the perfect mix of performance and glamour. Truly Kareena is the undisputed Queen of Bollywood. August 12, 2008. Bolly News, Kareena Kapoor. Leave a comment. Wedding bells may not be that far away for actors Saif Ali Khan and Kareena Kapoor as the two are contemplating marriage sooner than the three-four-year target they had set earlier. ‘Oh yes, much sooner. In fact, people may be hearing an announcement from us very soon. If I had my way, I’d marry her today right here in London where she’s joined me,’ Saif told IANS over phone. ‘Yes, I’m ready to make it legal any time. In any case, aren’t we supposed to have gone through a secret Muslim marriage?’ he says sarcastically about certain media reports. Saif was married to Amrita Singh and after 13 years of marriage and two children, the couple separated in 2004. After he divorced Amrita, he dated Italian model Rosa Catalano, but broke up with her in 2007. The romance between Saif and Kareena took off on the sets of Tashan. And Saif has never sounded so fiercely committed. Saif can barely contain his anxiety and eagerness to do the right thing. Saif admits it would take his children Sarah and Ibrahim a while to get used to the changes in their dad’s life. ‘I’m not going to pretend that my children, Kareena and I have become one big family. They’re intelligent kids with a mind of their own. Sarah is in fact 13 and a lady herself. It would be quite a while before they are fully comfortable with the change in my life. Saif is upset with reports that he has lately been crowding his ladylove with his attentions. © Copyright 2008 Indo Asian News Service. July 7, 2008. Bolly News, Kareena Kapoor, Saif Ali Khan. Leave a comment. With five films, nine endorsements and three stage shows, Kareena Kapoor says she is overworked and exhausted. ‘I’ve five films in various stages of production. Then I’ve nine endorsements for which I’ve to shoot ads round the year. Plus I’ve all these stage shows that require rehearsals. I can’t seem to find the time to do anything properly,’ Kareena told IANS on phone from Melbourne. She’s shooting for Salman Khan’s Main Aur Mrs Khanna in Melbourne. She has, in fact, agreed to perform at the International Indian Film Academy (IIFA) awards on June 8 in Bangkok and is rehearsing for it. ‘I’m performing a medley of my songs from Jab We Met and Tashan. Gone are the days when I’d go on stage with just a little practice. Now I want to be my best in every stage performance. ‘Here in Melbourne I’m rehearsing for IIFA at nights and shooting during the day. Am I overworked? I’m exhausted. But what choice do I have? I’ve decided to take my live performances as seriously as my movies and endorsements,’ she said. After Melbourne and the IIFA performance, Kareena will spend some time with her beau Saif Ali Khan in London and then move to Los Angeles for a 40-day shooting for Sajid Nadiadwala’s Kambakht Ishq. She’ll join Saif in London from June 20. Saif will be shooting in the city for his first home production to be directed by Imtiaz Ali and Deepika Padukone is playing the female lead in it. And Deepika is seeing Kareena’s cousin Ranbir. No hard feelings about not being in Saif’s first home production? June 3, 2008. Bolly News, Kareena Kapoor. Leave a comment. Agreed that Kareena Kapoor commands the fattest pay packet in Bollywood and that she is looking hotter than ever before, but that does not mean that she can throw her weight around on all and sundry. A mole says that Bebo was to finish shooting in three days flat for a song choreographed by Pony Varma for Priyadarshan’s Billoo Barber, but due to her late arrivals on a daily basis, it took five full days to finish the shoot. (Kareena is doing a song and dance number for the second time in six months; the last one being ‘It’s Rocking’ for the film Kya Love Story Hai). Unit members tell us that though the actress picked up her steps pretty fast (unlike earlier times), but the speed at which she would storm into the sets was a bit appalling. We wonder if the reason for her coming late to the sets is due to her long late night drives on Mumbai roads with beau Saif Ali Khan in his new car. Whatever! May 5, 2008. Bolly News, Kareena Kapoor. Leave a comment. Watch the silver screen sizzle this summer as the hottest bods in Bollywood come together in Tashan. April 7, 2008. Hot Stills, Kareena Kapoor, Sexiest Desi. Leave a comment. 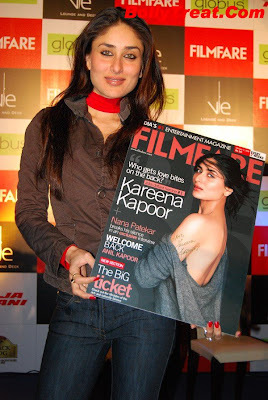 Kareena is riding high nowadays, thanks to the success of “Jab We Met”. And now that the lady has carved a niche for herself in the industry, she is experimenting out new and bold stuff. Kareena is going real bold with her new movie “Tashan”. Sources reveal that she will be shooting a scene in a “bikini”. Critics say Kareena is doing this in order to prove that she is better than Bipasha- her long time rival.Bipasha got great reviews for Dhoom II , her bikini stunts proved to be a great hit. The speculation out there is that no actress has refused Yash Raj banner with regards to the demands they have made. And it is the same with Kareena, she has never posed in a bikini in any of her films but is posing in one for: “Tashan” which comes under Yash Raj’s banner. When asked to comment about it, Kareena says just one thing “The Script demanded it”. January 29, 2008. Bikini, Bolly News, Kareena Kapoor. Leave a comment. January 29, 2008. 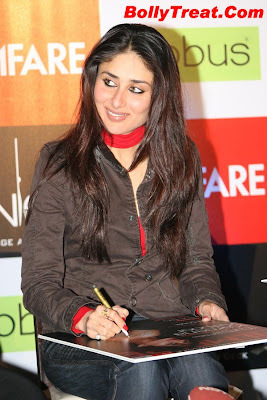 Events and Parties, Kareena Kapoor. Leave a comment. October 31, 2007. Hot Stills, Kareena Kapoor, Sexiest Desi. Leave a comment.